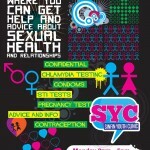 The design for the Derbyshire Sexual Health website was a complex undertaking. The project passed through the hands of 3 project directors, 2 focus groups at every design stage, had to pass web accessibility criteria and Derbyshire council’s own branding guidelines. We also had to ensure it would fit in with the web developer’s needs. The design went through many changes to make sure the client was 100% happy with the finished result. Working closely in tandem with other existing resource material, this website is going to be the linchpin of the council’s latest sexual health awareness campaign.